Shimla: The Himachal cabinet onTuesday gave its approval for amendmending Section 35 of the H.P. Town and Country Planning Rules, 2014 so that the deviations in the construction are compounded expeditiously in light of various judicial pronouncements. The Cabinet also decided to fill up 2277 vacant posts of various categories of teachers on contract basis in the Elementary Education Department. These include 671 posts of JBT, 835 of TGTs, 375 posts of Shastri and 396 posts of Language Teachers. It also decided to implement the Himachal Health Care Scheme (HIMCARE) in the State. The cashless treatment coverage of rupees five lakh per year per family will be provided under the scheme on family floater basis to all five members of per family as a unit. Medical treatment will be provided on the basis of pre-defined package rates in the empanelled hospitals. The hospitals empanelled under Ayushman Bharat will stand automatically empanelled for HIMCARE. This will cover all families of the state which are not covered under Ayushman Bharat scheme. 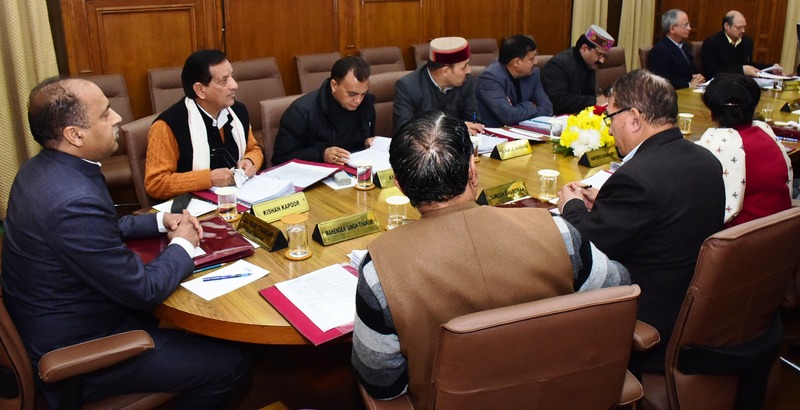 In another decision it has been decided to establish the Himachal Pradesh Gau Sewa Aayog for preservation, conservation and welfare of cows in the State. It would regulate the institutions like Gausadans, Gaushalas, cow sanctuaries, Gau Vigyan Kendras and community animal rearing centres etc. engaged in welfare of cows. The Confederation of Indian Industry (CII) will be the main partner at National level for Himachal Pradesh Global Investors Conclave proposed to be organized in June, 2019 at Dharamsala. A Sub Committee would be constituted under the Chairmanship of Additional Chief Secretary (Industries) to hold discussions with CII and finalise the Memorandum of Understanding.